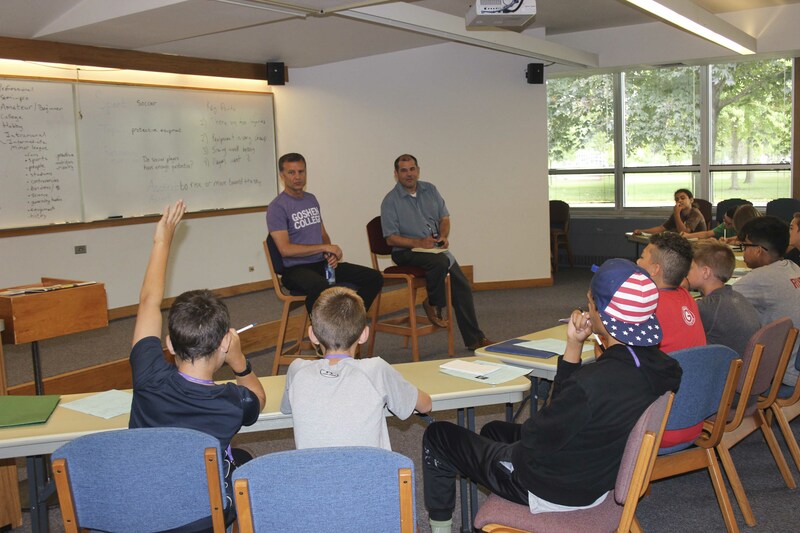 Bob Toews, left, and Anthony Anderson at a mock news conference at Goshen Write on Sports. Bob Toews, the assistant director of institutional research and academic database manager for Goshen College, prefers to take the stairs, even when the elevator is available. And when he takes the stairs, he likes to run. In September, he plans to run up 75 stories (that’s 1,664 steps) at the US Bank Tower in Los Angeles, the tallest stairwell west of the Mississippi. He is signed up to compete in the “Stair Climb for Los Angeles.” About 4,000 people are expected to race up the stairs, one at a time, and then take the elevator back down for a block party. Toews is ranked No. 47 in the country in stairclimbing, as the amateur sport is known. Toews, who grew up in Kansas, said that he started climbing stairs as an eighth grader as a way to stay in shape. At the time, he fantasized about racing up tall buildings. Bob Toews leads campers on a quick ascent in the Science Building before lunch. Many years later a professor at Goshen College in casual conversation happened to mention just such a race, in Chicago, that he was planning to run in,”Hustle Up the Hancock.” Toews signed up as well. That became his first race, 94 floors of vertical challenge, in 2006. Toews said his highest climb was the Willis Tower, at 103 stories (2,115 steps). He finished in about 20.5 minutes, 7 minutes or so off the winning time. 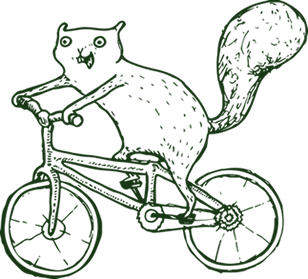 Many of the races are also fund-raisers. The race in Los Angeles, for example, will benefit the YMCA. 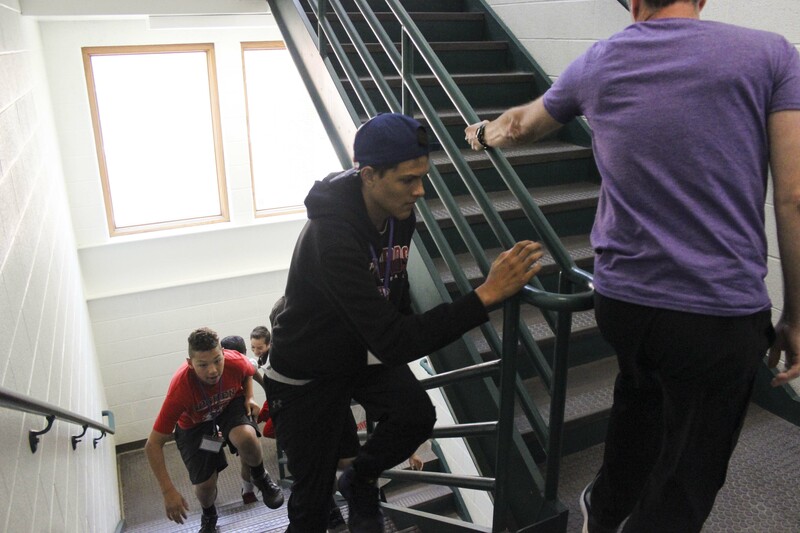 After the interview, in which students also had a chance to ask questions in both news conference and locker-room settings, Toews led the group on a quick “ascent,” as training intervals are called, up the four flights of the Science Building, where he sometimes trains.